The birth control pill contains active and inactive hormone pills. Active hormone pills prevent ovulation as well as the lining of the uterus from thickening. Inactive hormone pills, the seven off-colored pills in your pack, allow for a monthly menstrual period, though typically lighter than a normal menstrual period due to the thin uterine lining. Withdrawal bleeding and breakthrough bleeding is not the same thing. Withdrawal bleeding occurs when you take the inactive pills in your birth control pack. Withdrawal bleeding mimics a normal menstrual period. 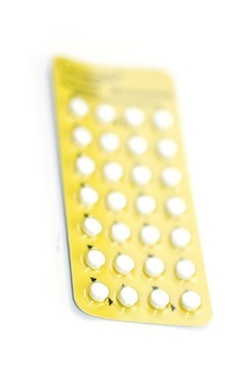 Breakthrough bleeding occurs while taking active hormone pills in your birth control pack. Breakthrough bleeding tends to be lighter and can occur at any time, but typically resolves within the first three months on the pill. Monthly birth control packs contain 21 active pills and 7 inactive pills. While taking the inactive pills, withdrawal bleeding may occur. The bleeding mimics a normal menstrual period. Some women, with doctor approval, choose to bi-cycle birth control packs. Bi-cycling means taking two packs of active pills concurrently, eliminating withdrawal bleeding at the end of the first pack. Withdrawal bleeding will still occur, but women have only six periods a year. Tri-cycling is the same as bicycling, but three active packs of birth control are taken concurrently. Women have withdrawal bleeding four times per year. Some forms of birth control eliminate withdrawal bleeding altogether, though this practice is not common when using oral birth control. If you have spoken with your doctor, who approved the continued use of oral birth control, look for breakthrough bleeding. When breakthrough bleeding occurs, you may be advised to take the seven placebo or inactive pills to allow for a menstrual period before restarting your continuous hormone intake. Is Withdrawal Bleeding Medically Necessary? A growing number of obstetricians and gynecologists accept the idea that withdrawal bleeding is not necessary for women using the pill. Prolonged use of birth controldoes not appear to increase the risk of breakthrough bleeding or other side effects and may reduce out of pocket cost for monthly feminine products. Women have been using a continuous dose of birth control for years to prevent menstrual periods for special occasions like weddings, honeymoons, and vacations with no negative side effects. Some doctors even subscribe to the idea that withdrawal bleeding or normal menstrual periods are not needed at all in women who are not ready to start a family.